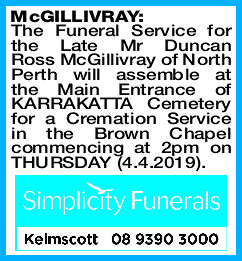 The Funeral Service for the Late Mr Duncan Ross McGillivray of North Perth will assemble at the Main Entrance of KARRAKATTA Cemetery for a Cremation Service in the Brown Chapel commencing at 2pm on THURSDAY (4.4.2019). 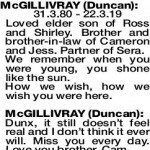 MCGILLIVRAY DUNCAN 31.3.80 - 22.3.19 Loved elder son of Ross and Shirley. Brother and brother-in-law of Cameron and Jess. Partner of Sera. We remember when you were young, you shone like the sun. How we wish, how we wish you were here. 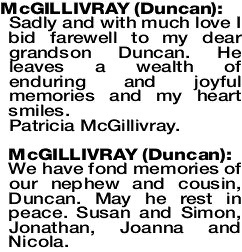 MCGILLIVRAY DUNCAN Sadly and with much love I bid farewell to my dear grandson Duncan. He leaves a wealth of enduring and joyful memories and my heart smiles. We have fond memories of our nephew and cousin, Duncan. May he rest in peace. Susan and Simon, Jonathan, Joanna and Nicola.